PRICE: Around $30.00 when available. I got mine at an on-line auction. NOTES: Short run with photo etch and resin parts. The SalThe production version of the Ye-7M was a modernised MiG-21PF, with an upgraded RP-21M radar, SRZO-2 Khrom-Nikkel IFF transponder and other changes in avionics. Further, later-production PFMs reintroduced cannon armament, in the form of the capability to carry a GSh-23 cannon and 200 rounds in an underbelly pod. Following tests in 1966, MiG-21PFM aircraft built after 1968 could carry the Kh-66 air-to-surface missile. This was the last of the second generation MiG-21 Interceptors and was known by the NATO designation of Fishbed F. There was no G and the Fishbed H was the recon version of the PFM. Most of these aircraft had the side opening canopy and a broader fin (introduced in the MiG-21 FL)than those of the earlier versions. 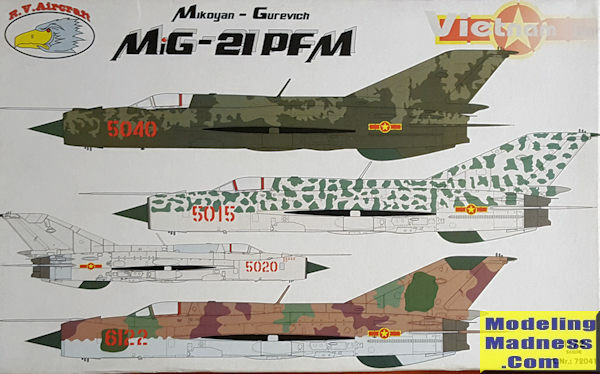 The PFMs are later Vietnam War MiG-21s with the MiG-21 PFL being the earlier variant used. There are types listed as PFVs (V for Vietnam) but this designation has often been confusing and frequently not shown in various records or web sites. RV Aircraft started out as doing resin and have since moved into injected plastic. They do a variety of Soviet/Russian aircraft, including a full range of MiG-21 and MiG-23 aircraft. This one is molded in a brownish plastic and includes such amenities as a metal pitot tube a color photo etch fret for the cockpit and a standard p.e. fret for other bits like gear doors, wing fences and some other bits. Honestly, the instructions are pretty mum on just where most of these bits go and you don't have to replace the plastic bits if you do not wish. The cockpit p.e. set comes with its own instructions. There are also some canopy masks included, which is a nice touch. Resin bits are mostly cockpit pieces and the nose gear well. The kit comes with two sets of wings which differ only by the shape of the gear wells. There is a requirement for 10 grams of weight and there is room for it above the gear well and perhaps under the cockpit. Main gear wells are a single piece and are marked as to which side goes where. Typical of these sorts of kits, all the external scoops are separate pieces. I should mention that the wings are a single casting as are the tail planes. Forward speed brakes can be posed lowered. The rear one is molded shut. Laning dear are nicely done and appear to be scale. One rather odd omission is that there is nothing for under the wings. No missiles though the pylons are provided. For the fuselage you can install the centerline pylon, but there is nothing to put on it. Most of us will install the gun pack and scrounge what spares we have for missiles. Instructions are basically a folded sheet of paper with five well drawn construction steps. It is basic, but usable. No interior color info, no gear well or landing gear info. All of that is left to the full color painting guide, which is useful for the camouflage and other exterior shades. Most of the options are unpainted metal with several of them in various camouflage schemes. Just about all of them are from 1972 with the 921st and 927th Regiment. Color information is generic with no paint references. 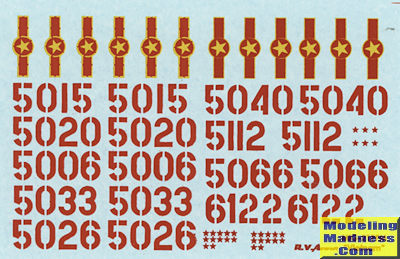 The decal sheet is nicely printed and provides more insignia than you'll need so save them for other MiG-21s with crappy decals! I have used RV decals and they are well done. This is a kit for the experienced modeler. The somewhat sketchy instructions along with 'exotic' materials like p.e. and resin mean that newbies need to carefully think about it before tackling this one. 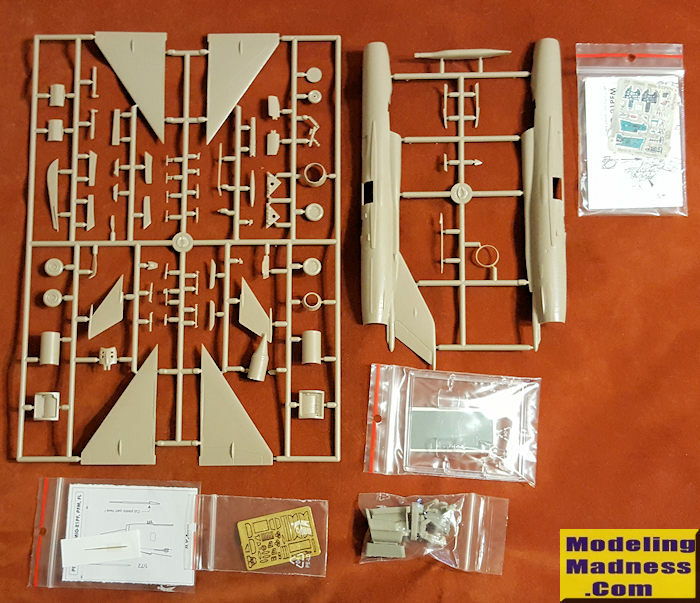 The rest of us who have done kits like this should not find anything unusual with it and the end result should be a very nice model for one's MiG collection.